Business After Hours – Business After Hours (BAH) is a monthly networking event to help members get to know one another and build their list of contacts and customer base. Business After Hours is held the second Thursday of every month (with the exception of December and January) from 4:30pm - 6:30pm and hosted by a Chamber member company. An evening of great networking, prizes and food! Contact Julia Sander at jsander@peoriachamber.org or 309.495.5973.
Business Before Hours –Start your morning off right by coming to network with other members of the Chamber at Business Before Hours. Develop potential leads and build business relationships before the workday begins. In addition to networking, each Business Before Hours features a speaker and/or topic of discussion. BBH is held the fourth Tuesday of every month (with the exception of November and December) from 7:45am – 9:00am. A continental breakfast is served. Contact Julia Sander at jsander@peoriachamber.org or 309.495.5973.
Business Showcase- The Business Showcase is the annual business expo. It is the largest B2B networking event of the year. Use this event to roll out a new product or highlight a current product. This is a great way to learn what other member business’ offer. Chamber 101 – Chamber 101 is a rotating series of sessions offered quarterly. The sessions include Membership 101, Networking 101 and Marketing 101. Chamber 101 is held the second Monday of every month at 3:00pm at the Chamber office (100 SW Water St, Peoria). This is a great opportunity for new members to learn about the Chamber and meet other Chamber members. Contact Julia Sander at jsander@peoriachamber.org or 309.495.5973. CIRCLE Lobby Day – CIRCLE or Central Illinois Chambers Legislative Effort is a collaboration between 15 Chambers in the central part of the state. Together the chambers identify key state issues of common interest and jointly go to Springfield to lobby legislators on these issues. Over 100 business leaders from the local chambers participate every year. CIRCLE Legislative Reception - This annual event which is another project of the Central Illinois Chambers Legislative Effort offers the opportunity to improve the lines of communication between the business community and our state elected officials. This reception will give you the opportunity to speak directly to area representatives on issues that are important to you. Community Leadership School – Community Leadership School (CLS) unites 42 adults around a single goal: to motivate and inspire its participants to a higher level of community awareness and involvement. In its 37th year, CLS has become the trusted program for transforming talented people into true community leaders. Community Thanksgiving Luncheon – The Thanksgiving Luncheon is an annual event held to celebrate and recognize all that the business community has to be thankful for in the past year. Each year a local business leader presents the keynote speech. In addition the Chamber presents the ATHENA, Outstanding Small Business and Tom Connor Volunteer Service Awards at this event. Golf Outing – The Chamber Golf Outing is held every year and is one of the Chamber’s most popular events. The Golf Outing is a great networking opportunity and a great day of golf for all participants. Use this event to communicate with a client or as a perk to your staff. Either way you will meet lots of other area business professionals. Contact Mary Ardapple at mardapple@peoriachamber.org or 309.495.5920. Public Affairs Series – The Public Affairs Series brings in speakers from around the state and nation who have an impact on public policy to share their perspective with Chamber members. Speakers can be elected officials but also can be industry leaders who serve in positions where they can influence policy makers. This is an opportunity for Chamber members to hear directly from these leaders on current issues and challenges. 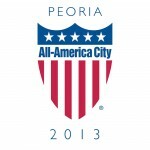 Contact Jolene Cole at jcole@peoriachamber.org or 309.495.5920. State of the City - Peoria Mayor, Jim Ardis, presents his view on the State of the City of Peoria to the local business community. Mayor Ardis has often used this event to announce new initiatives for the community. This is a ‘must attend’ event for the Peoria area business professional. State of the Schools – Peoria Public Schools Superintendent, Dr. Grenita Lathan, shares her view on the state of the region’s largest school district. Dr. Lathan talks about both the successes within the District and the challenges they face. This is an opportunity to get a good view of what is happening within the Peoria Public Schools.